A group of runners will run a 46-47k run through the streets of Dubai this coming Friday, starting at 6am. They do it to raise money for the treatment of an Iraqi friend and former rugby player, nicknamed Moe, who has been diagnosed with cancer. While this group runs, another group will kayak around The World just off the Dubai coast. The runners and kayakers will meet at 12pm at an agree spot on the beach. This coming Friday, Moe will also get his 5th chemotherapy. (If you want to read more about this and support the cause, please check here). While I have never met Moe, I am truly impressed by the initiative and motivation of people to support him, by giving money and running either the whole distance or just parts of it. For everyone not familiar with Dubai weather: it's boiling hot, the temperatures while they run will be between 35 and 40C, and there is hardly any shade. It seems a dangerous undertaking to run that far in this heat. I don't deny this. Most people who will run, are experienced runners. Most of them will have some experience of running in extreme heat too. They do it as a group and it's not a race. Their motto is, if Moe can fight cancer, we can run, walk, crawl 47k. My little contribution on the day will be to set up a water station at the 25k mark of the route, where I provide cold water, sports drinks, bananas, orange pieces, GU gels and cold sponges/towels when the group comes past sometime around 9am. Anything refreshing and cool is probably all they will want. If I could set up a bathtub full of ice cubes, they'd most certainly jump in it. I'll be on a public parking lot of a post office, so cooler boxes full of ice cubes is all I can do. Today's fruit salad is nothing fancy really while all the way refreshing. Chunks of grapefruit deliver the tartness while oranges bring in the sweetness. Pomegranates add another flavor and some texture. Drizzled with a lemon honey dressing and sprinkled with a handful of fresh mint leaves, it is as simple and invigorating as it can get. Peel grapefruit and oranges carefully. Get rid of as much white skin as possible. Cut the top off the pomegranate and gently break the fruit in halves, then in quarters. Carefully separate the arils from the membrane. Keep the clean arils aside. 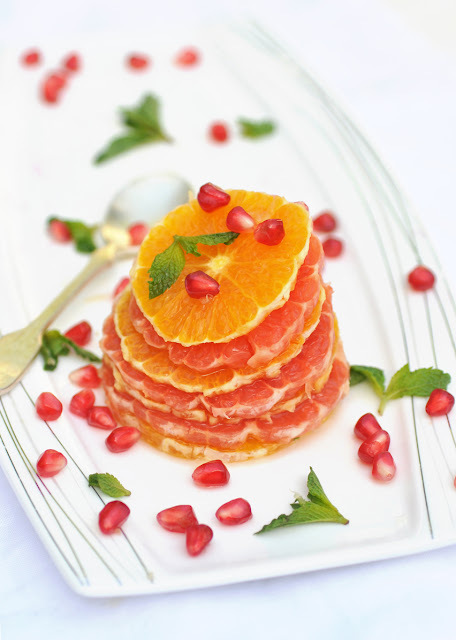 With a sharp knife, cut all grapefruit and oranges into thin horizontal slices. Arrange in serving bowl or plate. Sprinkle over the pomegranate seeds. Mix lemon juice and honey in a small bowl. Pour over the the fruit salad. Garnish with fresh mint leaves. Serve cold from the fridge.